Editing pages is easy and fun. Don't be scared to make constructive amendments to the content of Physiopedia! You be using a laptop or desktop computer to make edits to Physiopedia, it is not possible to edit the site on a mobile device. You must be logged in to your editing account to make edits to the site. 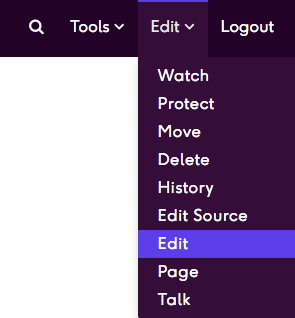 You will know if you are logged in when the Edit, Tools and Logout links appear in the right of the purple Navigation Bar at the top of the page. Go to the page in Physiopedia that you wish to make edits to and click on the Edit link in the Edit drop down menu in the navigation bar at the top of the page. When you click on the Edit tab the look of the page will change slightly and an Editing Toolbar will appear at the top of the page. You can make changes to the text on the page by editing it directly on this page and using the editing toolbar to format the text, add links etc.Explore all the functions on the editing toolbar to get to know how they can help you format a page. If you wish you can practice your page editing skills without damaging real Physiopedia content in the Sandbox, this is a page set aside specifically for you to try out editing! When you have finished making your amendment click the big blue Save page button at the top of the page. Top Tip: save often to avoid losing work!! You will see the new version of the page which is now live on the Physiopedia site. Well done you have successfully edited a page! If you wish to make more complicated edits to the page you might want to delve into the Source Code (also known as wikitext). You can access this by either clicking on Edit Source under the Edit drop down menu or by clicking the [[ ]] in the Editing Toolbar. See the mediawiki site for more help editing the source code.